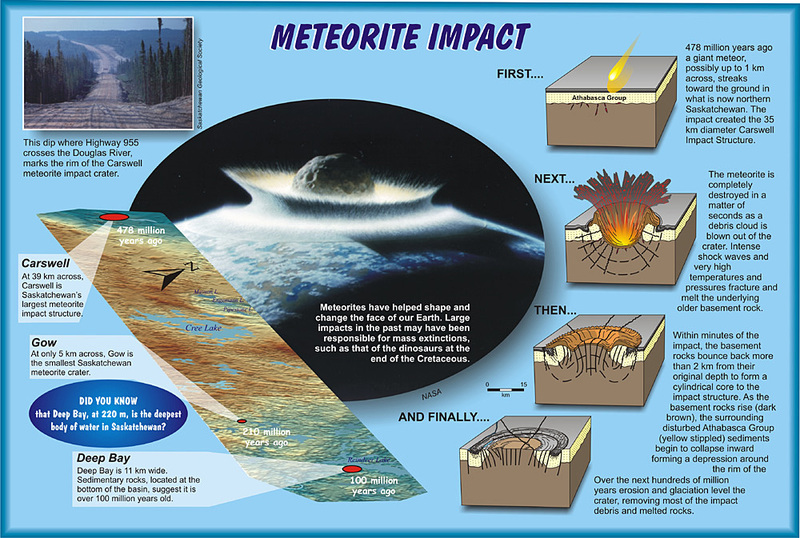 Meteorites have helped shape and change the face of our Earth. 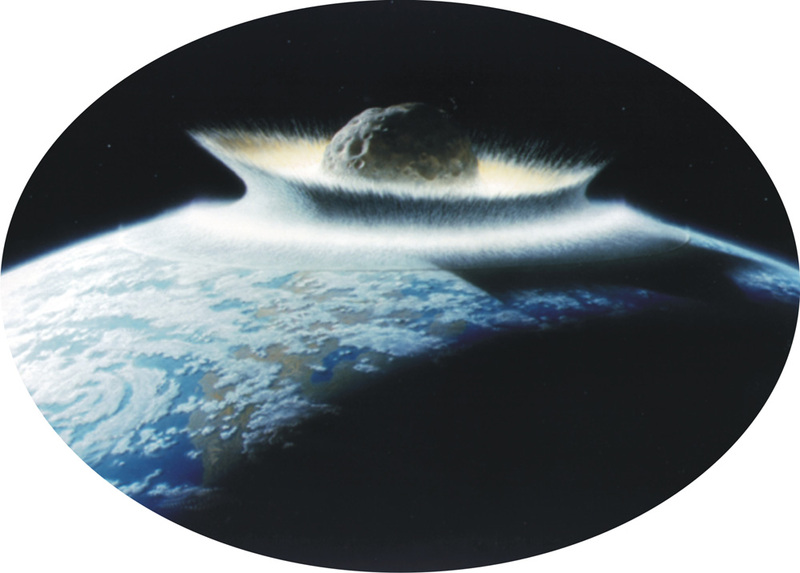 Large impacts in the past may have been responsible for mass extinctions, such as that of the dinosaurs at the end of the Cretaceous. 478 million years ago a giant meteor, possibly up to 1 km across, streaks toward the ground in what is now northern Saskatchewan. 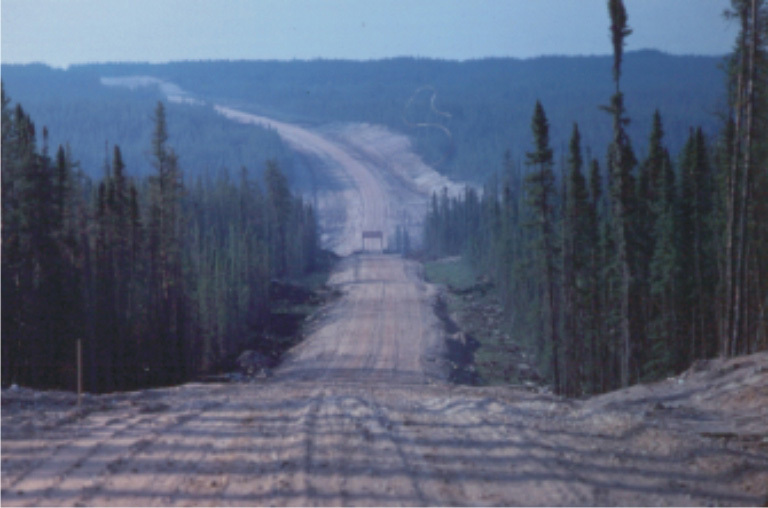 The impact created the 35 km diameter Carswell Impact Structure. The meteorite is completely destroyed in a matter of seconds as a debris cloud is blown out of the crater. 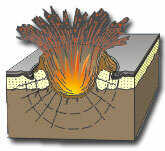 Intense shock waves and very high temperatures and pressures fracture and melt the underlying older basement rock. Within minutes of the impact, the basement rocks bounce back more than 2 km from their original depth to form a cylindrical core to the impact structure. As the basement rocks rise (dark brown), the surrounding disturbed Athabasca Group (yellow stippled) sediments begin to collapse inward forming a depression around the rim of the crater. Over the next hundreds of million years erosion and glaciation level the crater, removing most of the impact debris and melted rocks. At 39 km across, Carswell is Saskatchewan's largest meteorite impact structure. At only 5 km across, Gow is the smallest Saskatchewan meteorite crater. 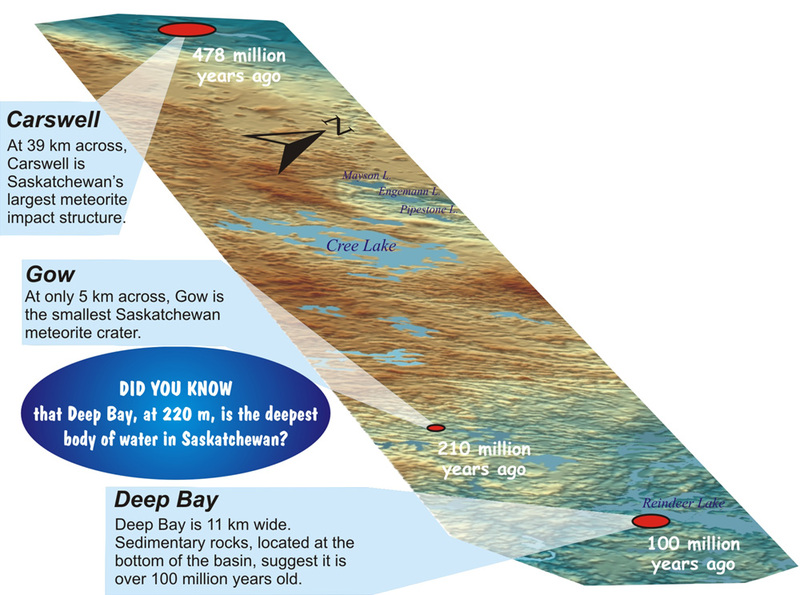 Deep Bay is 11 km wide. Sedimentary rocks, located at the bottom of the basin, suggest it is over 100 million years old. This dip where Highway 955 crosses the Douglas River, marks the rim of the Carswell meteorite impact crater.